2019 Spring State Tournament Registration Now Open! The 2019 Spring State Tournaments will be played at the Brand New Olathe Soccer Complex from May 28th - June 6th, 2019! 2019 Kansas State Cup: Click Here #KSStateCup?????? 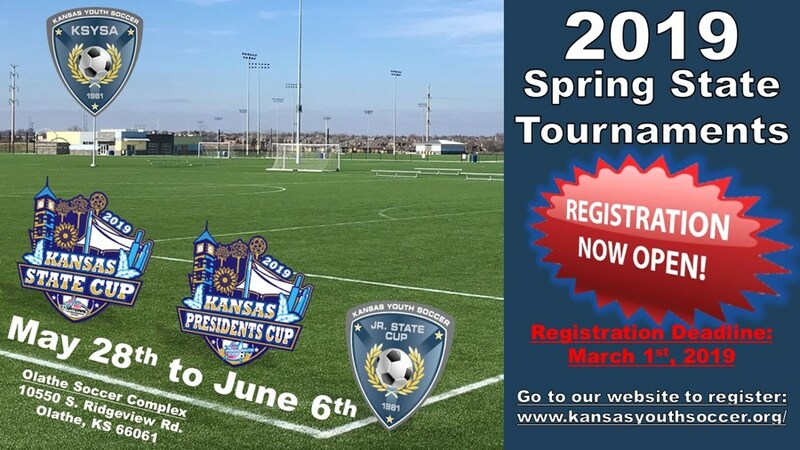 2019 Kansas Presidents Cup: Click Here #KSPresidentsCup?????? 2019 Kansas Jr. State Cup: Click Here #KSJrStateCup?????? Winners of Kansas Jr. State Cup do not advance anywhere as there is no regional event yet at this time. It is more of an event to get young Under 11 & 12 exposure to the State Tournament competitive atmosphere and develop their skills. So start planning your summer vacation time wisely parents because you do not want to miss out!